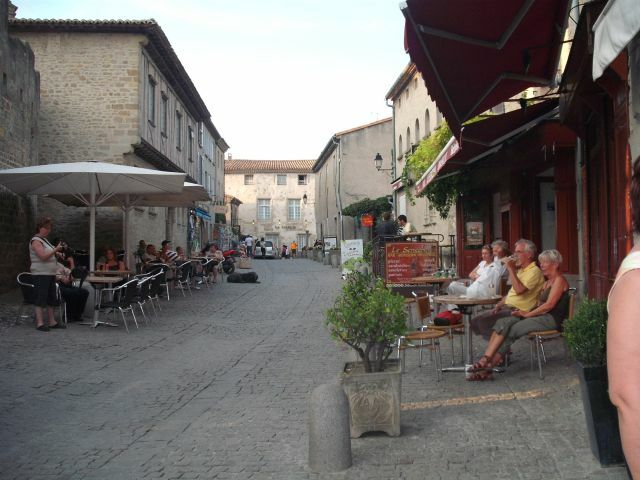 It was nice to have a slow start and a chance to explore the town of Carcassone. 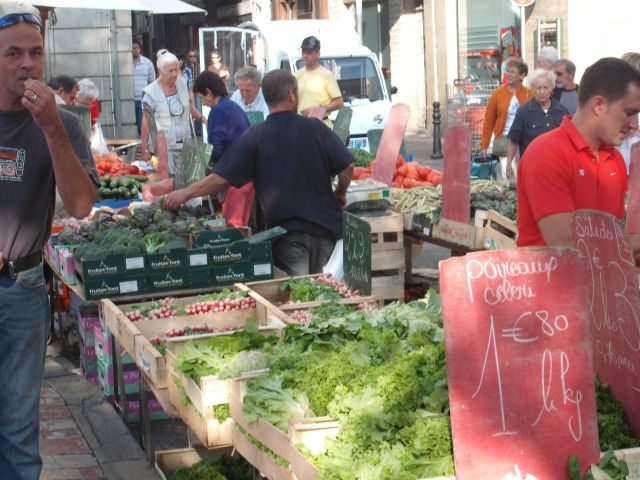 From the window of our boat we saw a steady stream of people with their shopping baskets and bags heading for, what we assumed was, the market or marche. We had no idea there was a market close by, so we leapt up, wolfed down our breakfast, and bags in hand, followed the stream of people. We easily found the market. We had done a huge shop-up the day before but we could not help ourselves and bought yet more food. There were stalls upon stalls of sheep cheeses, goat cheeses, cow cheeses, fresh fruit and vegetables, fresh herbs, dried fruits and nuts, assorted pastries, breads, and so much more yummy food. I have never seen so many different types of mushrooms. One can compare prices, check the quality and pick the very best potatoes on offer for the day. No wonder we didn’t have any desire to eat out. Where else would we have bought sheep cheese? Who knew it was so nice? Walking back from the market we went past Le Capitaine or La Capitaine in this case and we asked for a mooring with water and electricity. The moorings had been around €5.00 up till now – this one was €29.00. But then they had washing machines, ‘Wiffy’, showers, proper loos and even security for some reason. 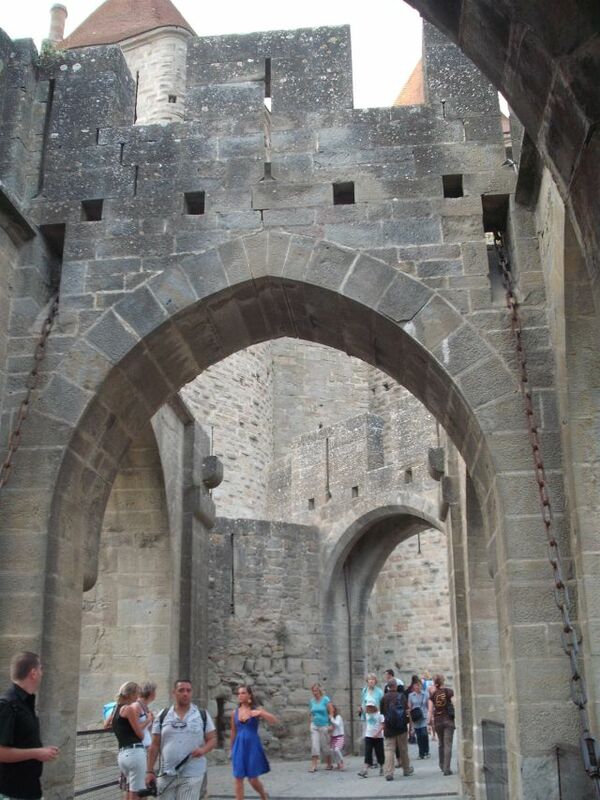 The fee at Carcasonne was based on the length of the boat, the amount of occupants and they also charged tax. Like many French people, when we asked her if she could speak English, she said she would, if we tried to speak French, which is fair enough. They usually revert to English and speak it well. We went for a stroll to look at other boats. Since we had been staying on a boat we were intrigued by other people and their boats. My other half got chatting to a few more boat owners about the pros and cons of their particular boat types. One guy had a couple of boats scattered around Europe and he alternated between them. Some people travel with their dogs. I’m never sure how much the dogs enjoy being stuck on a boat. Another good reason for taking a day out of the trip was a chance to see La Cite. 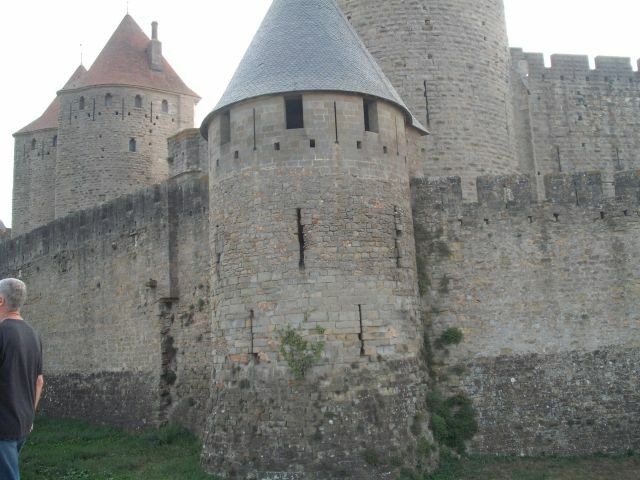 It’s a medieval fortress or an old city 2 km from the centre of Carcasonne. It’s full of the usual tourist trappings and tat but well worth having seen. On the way home we discovered a bunch of runners next to the quay and it turned out there was a race that evening. We heard strains of Pink Floyd and the Beatles going on in the background. Later we heard them announcing what we assumed were prizes for the winners which went on well into the night. I never understood a word for all my French lessons. My other half bought a ready-made Cassoulet, which is one of the dishes of the region for supper. It’s a haricot bean and sausage stew with duck meat for flavour. I made my own version of a warm goat cheese salad and polished off the left over pasta from previous night. We made a honey mustard salad dressing with the local honey and mustard we bought at the markets. We headed off for Bram as per the Locaboat travel suggestion. There was a lot less traffic on this section of the canal than the area we covered a few days previously, which made the journey a lot easier. The day was going well and there were only 3 locks for the day. The locks have some interesting names and one does wonder. We passed through a Lock Criminelle. 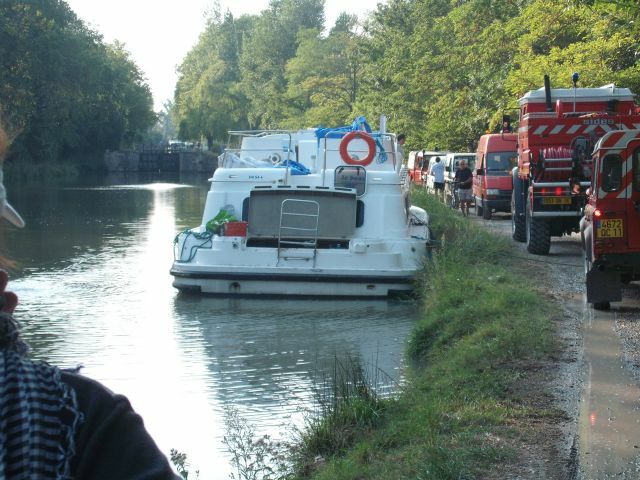 We have done French and UK canals before, with very little trouble. This trip had its share of drama. We made good time till we got to the lock prior to Lock de Guilhermin. At Guilhermin a boat managed to get bashed inside the lock and cracked. She started taking in water and she sank just outside the lock. The lock keeper at the next lock shut down so fast. We thought that was us done for the day. We ended up going for a walk to see the unfortunate boat. The canal was cleared fairly quickly and we managed to make one more lock but we lost 1-½ hours. We settled for the night outside the next lock miles away from anywhere. My other half made a lentil curry and we sat sipping wine, writing, doing sudoka’s and listening to the ducks squawking outside.